Page Updated:- Saturday, 01 December, 2018. Above photo taken with permission from Saunders family web. Awaiting picture of Whitbread sign. Above card issued March 1955. Sign series 4 number 28. Mr. Dorman, of Westgate, made two applications for the transfer of the “Beach House Hotel,” Westgate, from George Francis Verini to John Walter Knagg, and also that of the “Nottingham Castle,” Westgate, from Charles Logan to John Walter Knagg. The Bench granted the application. Whitstable Times and Herne Bay Herald 19 June 1897. MARGATE. CINQUE PORTS PETTY SESSIONS. 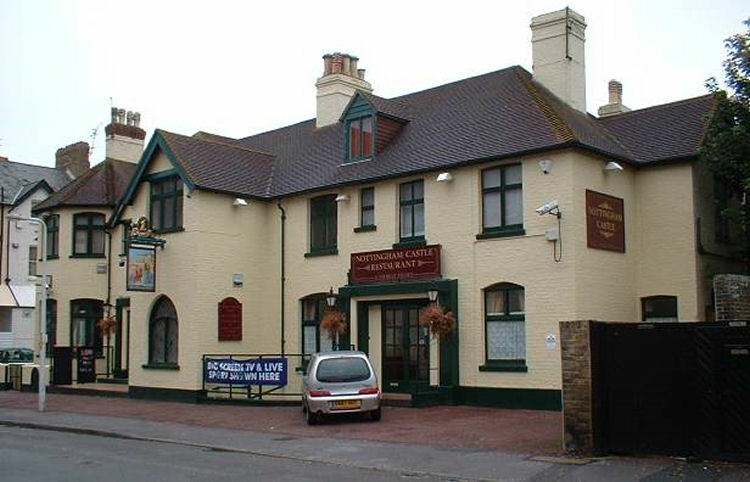 John Hooper Davies, of the "Nottingham Castle Hotel," Westgate-on-Sea, was summoned for having been drunk on his licensed premises on the 28th ult. P.C. Fowle said he was called to a disturbance at the "Nottingham Castle," and there found the defendant in his bar, rolling about in a "beastly state of drunkenness." The defendant ordered him out of the house, and said he did not care, as he could not injure him. Dennis O'Brien, a boatman, was present, and said the defendant had been drunk three days, and he did not deny it. He had had complaints of the management of the house. The defendant was so drunk that he could hardly speak. In cross examination, he said the disturbance was between defendant and his barmaid, who had been ordered by him to leave the house at a minute's notice. P.C. Bateman and Dennis O'Brien corroborated. Mr. Shea said an undesirable customer was in the house and the defendant was excited in consequence of a dispute with him and also with his barmaid. What the defendant was suffering from was not drink but excitement. The defendant, who it was stated by Sergt. Hoare, was fined in January, was now fine 20s. and 17s. costs. The defendant said there had been a great deal of spite against him. An application was made, prior to the hearing of the case, for the transfer of the licence; but the magistrates referred the applicant to the Dover justices. The Era 21 August 1897. "Nottingham Castle Hotel," Facing the Bathing Station. Special late Theatre Train on Saturdays at 12 o'clock, arriving about 2 o'clock, when hot Supper is served on receiving intimation by wire of intending visitors. E. D. Greenwood, Proprietor. The pub changed name to the "Knot" some time between 2009 and 2012.